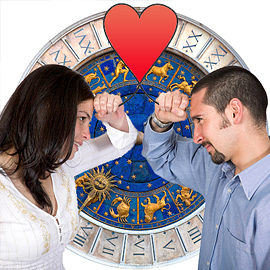 A Horoscope matching report of a couple will be based on an analysis of the couples' birth chart to find their mental compatibilities and see how harmonious, balanced and healthy their relationship is going to be. The report also gives remedies to resolve various afflictions in the chart. Marriage is a union of two people who come together to share their joys and sorrows. But due to various circumstances, couples often have to deal with fights, miscommunication and even separation. Vedic Astrology can be helpful in avoiding the circumstances leading to the baneful happenings by matching the horoscopes for mental compatibilities, analyzing planetary drawbacks in the horoscopes of intended matches and checking the couple's respective Dashas (Major planetary period) in accordance with their Birth Chart. Our Vedic astrologers will carefully analyze the Birth Star (Nakshatra) Compatibility of both the intended partner's horoscopes with respect to their planetary positions and prescribe potent remedies to deal with difficulties like Manglik & Kalathra Dosha. Please Note: To give you an accurate prediction, our astrologers will put in rigorous effort, time and expertise in each analysis, and the readings, results and recommendations about the status of the relationship are totally personalized. Take advantage of our Horoscope Matching Report and lay the foundation of a happy and prosperous married life.